Another busy week, but just enough time to get in a sneak preview of some coming cycle infrastructure: A few weeks back, I was lucky to visit the site of the new Northern Arterial, scheduled for completion in mid-2020. As you can see, the structure is very generous in its width; at least 5m wide through here – somewhat ironic, as the connecting pathway is typically only 3m wide. Like the structures built further south, it has been named across the top, although the term “subway” is perhaps a bit less clear than “underpass”. Speaking of the northern roading corridor, this is a good time to remind all that submissions on the City Council’s Downstream Effects Management Plan are due today (15th Apr). 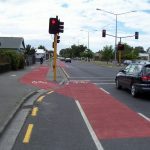 Have a read of Jim’s excellent blogpost last week about this or the Spokes Canterbury submission for some ideas on what to say. Do you like the look of the new “subway”? “Subway” is the British English term for underpass, as distinct from the US English meaning which the British call an underground railway. There are different contextual meanings apart from metro systems (NY has the subway; London the underground; Paris the Metro). I saw this in Birmingham, a city that was designed for the motorcar in the 1960s. 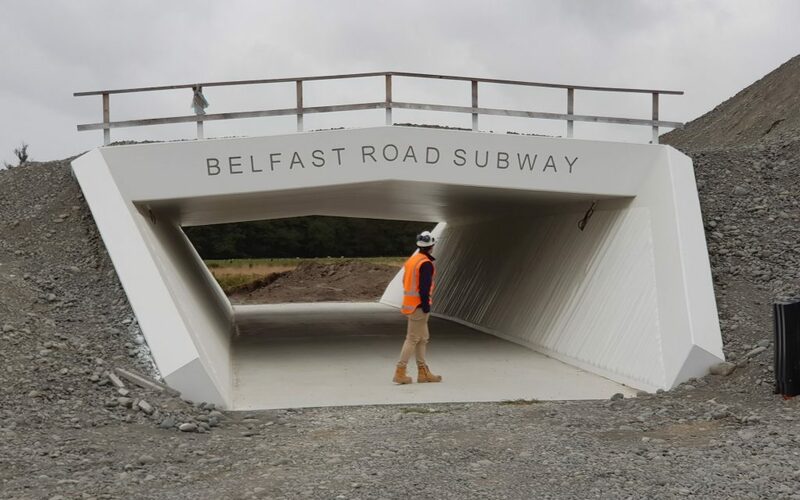 Here, subway is a term for pedestrian underground passages (usually awfully scary places; that’s why they got rid of most in the early 2000s) and underpass for vehicle-only passages as opposed to flyovers (again for cars only) that are sometimes simply called bridges in NZ or overpasses). The extra width at face height makes it feel larger and more airy while passing through. There’s one of these open on Winters Road already, and probably elsewhere too. Apparently there’s a LOT of steel in that upper section to hold the structure up. The side walls are also randomly ribbed, so there’s not really a good place to clearly mark graffiti either. All up, not a bad design.